San Diego Geological Society, Inc. The San Diego Geological Society is a group of geologists and interested participants working to promote geology and related fields in the greater San Diego region. 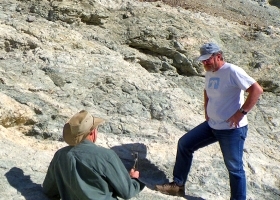 To achieve our primary educational objective, we organize frequent field trips and maintain a program of monthly meetings featuring speakers on current geological topics through San Diego Association of Geologists, our operational program. We also publish field trip guidebooks and other publications related to geology and natural history. We encourage scholarship and research by awarding scholarships from the elementary through graduate levels. SDGS corporate affairs are currently run by a board of directors. If you are interested in attending one of our events or volunteering with the society, please contact one of the members of the executive committee of the board or email us at board @sandiegogeologicalsociety. org and your query will be forwarded to the appropriate party. SDGS operates as a 501(c)(3) nonprofit educational corporation. As required by law, our Articles of Incorporation and Current Bylaws are available for public inspection, as are our State (FTB 3500) and Federal (IRS 1023) tax exemption applications and Federal exemption determination letter. Inquiries regarding a specific project or event should be made to the contact points listed above. Activities not listed may be reached via the "General Information" address below. Copyright ©2009-2017 San Diego Geological Society, Inc.